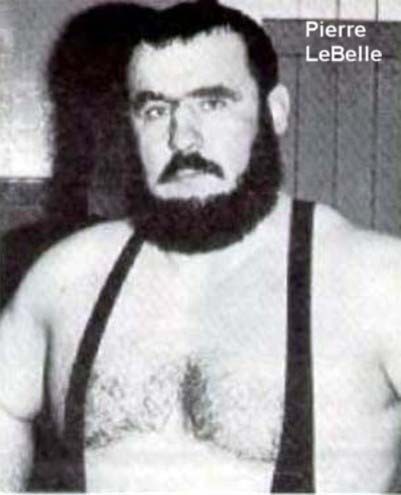 The Beast (Yvon Cormier) is the oldest of the famous Cormier Wrestling Brothers from Atlantic Canada (New Brunswick)..
~~~Including brothers Leo Burke (Leonce Cormier), Terry & Bobby Kay (Robert Cormier) and, later, Rudy Kay (Jean-Louis Cormier)..
Yvon Cormier had done various jobs as a teen, including working in the woods, shoeing horses, and driving heavy equipment. Yvon Cormier started wrestling with the encouragement of Eastern Canadian promoter, Emile Dupre..
Yvon Cormier was one of the early weight and health fanatics in wrestling..
1962: Yvon Cormier went to Indianapolis to train seriously, and started as a regular pro wrestler the next year as “Ivan The Lumberjack”..
Jim Crockett Sr. gave Yvon Cormier his name… THE BEAST! The Beast wrestled seven different World champions, including six, 90-minute draws.. The Beast wrestled Giant Baba in Japan in front of 45,000 people..
1967: Yvon Cornier toured Australia as “The Beast” with his brother “Professor Rudy LaBelle” as his wrestler/manager..
1979: Yvon Cormier bench pressed 527lbs..
1980: Yvon Cormier took a lighter schedule..
1999: Yvon Cormier participates in a Grand Prix Wrestling summer tour of Canada..
~~~He had been in poor health for a while, suffering from cancer as well as having two heart attacks..